If I’m less enthusiastic about the off-air Symphony No.2, that’s no reflection on Goossens’ vigorous attack and dramatic intensity, as impressive as any conductor recorded in this most urgent, dark and sinister of Bax’s symphonies. It was an astute move by the BBC producers planning the 1956 memorial broadcast cycle to engage Goossens for this one work. It fits his tight sense of control like a glove, and with the notable exception of some dodgy violin solos from their leader, he inspired the BBC Orchestra to give of their best. If only the original master tape could have been found. What we hear sounds like a once-removed copy at best, with little dynamic range and muddy detail at anything above mezzo forte. Some of it’s nearly inaudible. Ten years on, my wish is (all but) granted, for here is Richard Itter’s state-of-the-art personal recording of the BBC’s repeat broadcast, one day after the live relay, on November 3rd 1956. I doubt that a master tape could sound better. So what a treat it is to be able to hear this urgent performance unvarnished, with full dynamic range and all that mud washed away. Goossens’s sense of dramatic shape is fiercely compelling; and although his way with the strings (freely bowed rather than rigorously drilled) and the woodwinds (comparatively distant and reserved) is remote from the thoroughly modern mode of Lyrita’s own, astonishingly good 1971 recording with the London Philharmonic Orchestra under Myer Fredman (SRCD 233), its old-fashioned manners don’t diminish the performance’s matter one jot. Those ‘dodgy violin solos’ are rather more of a problem for repeated listening, as are the imprecisions inevitable in a live BBC broadcast. Goossens drives his orchestra hard and fast, and though the results are always rousing there’s sometimes a sense of the band hanging onto his coat tails for dear life. None of this detracts from the cogency of the whole, and as a demonstration of Bax’s symphonic logic this performance has scarcely been bettered. Anyone interested in the white-hot power of this brooding work needs to hear this account, from a conductor-composer who knew Bax well, knew what he wanted and – most important of all – knew how to get it. Talking of composers, another features in the second work on the disc, with John McCabe the pianist in a studio recording of Winter Legends with the BBC Northern Symphony Orchestra (aka BBC Philharmonic) under Raymond Leppard, first broadcast on 6 October 1978. Richard Itter’s recording is of supreme quality, and twenty years on from the Symphony the BBC’s stereo sound is crystal clear, dynamic and immediate. Once again the performance is thoroughly deserving of commercial release: I’d go so far as to say, that if these artists can’t convince us of this enigmatic work’s stature, then nobody can. If that sounds mealy-mouthed, I must once again confess that I remain sceptical about Winter Legends, especially its long opening movement. The problem is not one of loose structuring or verbosity – far from it, when every bar flows naturally from the preceding one, and the work’s idiosyncratic symphonic/concertante credentials are beyond doubt. Nor is there anything amiss with Bax’s spare melodic and harmonic invention, both appropriate to his title. Perhaps the problem is a lack of emotional connection between the music’s moods, sometimes bitter or dryly sardonic, sometimes delicately romantic, sometimes pallidly austere. The mood-meditations continually circle back on themselves, and the movement doesn’t seem to ‘go anywhere’, even given McCabe’s imaginative pianism and Leppard’s no less absorbing orchestral control – what splendid Baxians they both were! None the less, there is a sense of a missing key to an inscrutable movement. The measured Lento, with its more sustained contrasts of fridge-chilled romanticism and something close to Gershwin-esque humour (how unusually jazzy the piano’s initial theme is for Bax) fares better, while the Finale and Epilogue progress to a smoothly satisfying conclusion. This time round, Leppard’s phrasing of the orchestra’s main triplet-theme – oddly reminiscent of the ‘ranz des vaches’ from Rossini’s William Tell – brings with it a sense of warmth which infuses the rest of the work. Is this a hint that Spring is just around the corner, that the cattle can soon be let loose again on the mountain slopes, that the taut, frozen internalised winter world may soon be relaxed? Winter Legends doesn’t quite reach that point of release, but the promise is there. Like Ashley Wass, the Bournemouth Symphony Orchestra and James Judd (on Naxos 8.572597), McCabe and co. choose to adopt two, tiny optional cuts in the slow movement and a rather longer one near the start of the Epilogue. These are of no great matter, but if you want to hear the work absolutely complete then Chandos’s recording with Margaret Fingerhut and the London Philharmonic under Bryden Thomson remains a must-buy: despite a bafflingly sour and ethereal sound-scape, their gargantuan approach gives Winter Legends a gravity which later performances don’t match. For myself, I prefer McCabe’s wider selection of moods, and Leppard’s savvy sense of forward momentum. The BBC engineering (like Naxos’s for Wass) is undeniably superior to Chandos’s, and I would especially recommend this new release for newcomers to a still-controversial work. I enjoyed Rob Barnett’s exuberant, personal and often illuminating programme notes, too. 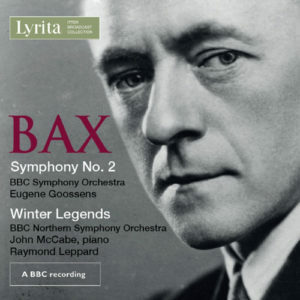 Although 80 minutes devoted to Bax’s two bleakest works might sound like too much of a good thing, there is no need to play the whole CD at once: and yet again, Lyrita’s Itter Broadcast Collection has come up with imperishable goods.